Kennedy School dean Douglas Elmendorf seemed to anticipate what was coming Thursday evening as he introduced an Institute of Politics event featuring President Lawrence S. Bacow. Standing onstage at the John F. Kennedy Jr. Forum, Elmendorf exhorted those in attendance, to be “respectful audience members,” to “listen, think, and learn” and to save their comments until after the talk. Thursday’s demonstration was the latest and most forceful by two student campaigns that have intensified their efforts in recent months, Divest Harvard and Harvard Prison Divestment. 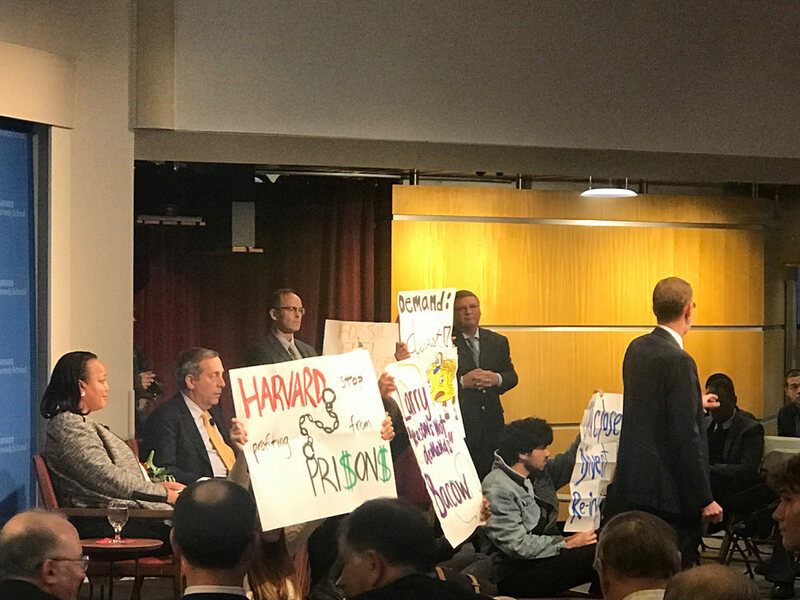 Two days earlier, protesters had unfurled a large banner reading “Harvard Profits from Womxn’s Imprisonment” behind Bacow as he spoke at the University’s gender equity summit in the Smith Campus Center. At the Kennedy School, the president rose to address the chanting students. Echoing comments he has made earlier, including in a meeting with students from the prison divestment campaign, Bacow said that he would respond to “reason,” but not “pressure.” He said he would be “happy” to meet with them again, and repeated Elmendorf’s request that they move to the back of the room. “You’re not being helpful to your cause,” he said. The protesters did not move, and began chanting anew. After a few minutes, Bacow, Long, and Elmendorf left the room, followed by most of the audience, and reconvened in a fourth-floor classroom. “Thank you all for your flexibility,” Bacow said, as listeners shuffled in and settled into the chairs that staffers were hastily assembling. “Universities are places where people express opinions, and they often express opinions sharply. We have to expect that.” Without protest, universities would be “dull places indeed,” he joked. “But that said, I do wish they’d taken the long view, because I mean what I said,” about reason and pressure. With that, the thirtieth annual Wiener Lecture, endowed by audience member Malcolm H. Wiener ’57, J.D. ’63, founder of Harvard’s Wiener Center for Social Policy, carried on. There were other questions as the event wound toward a close—audience members asked about mitigating economic inequality among students on campus; and about the reshaping of society by artificial intelligence. Bacow talked about the grants that give needy students “walking-around money” to join classmates for evenings out and recreational activities they might otherwise have to skip, about the ethics discussions now embedded in the computer-science curriculum, and about the importance of returning to a liberal-arts education that teaches critical reasoning. Then a man in the audience—a Harvard graduate and an immigrant, he said—asked about not only hopelessness in the face of inequality, but anger. “It seems universities should feel somewhat responsible for creating good citizens,” he said.